Dispatcher-assisted cardiopulmonary resuscitation (DA-CPR) is highlighted in 2015 resuscitation guidelines  because instructions improve bystander CPR rates [2–4], reduce the time to CPR [4–6], increase the number of chest compressions delivered, and might improve patient outcomes following OHCA [7, 8]. However, DA-CPR can be difficult because the dispatchers are placed in a complex, nonvisual environment, guiding bystanders who are in a stressful situation and often have limited basic life support experience. Simulation studies have shown that video transmitted from bystanders’ smartphones can be a valuable tool for dispatchers to facilitate DA-CPR  and that it can improve the lay rescuers’ confidence . Medical dispatchers have also indicated that it could be a benefit to receive visual information based on simulations of OHCA scenarios . This is in agreement with our previous study in which we used closed-circuit television (CCTV) recordings from OHCA, which indicated that the dispatchers’ situation awareness was challenged by not being able to see the victim as well as the bystanders’ reactions, though the medical dispatchers were not interviewed specifically about their perception of what happened on scene . Therefore, medical dispatchers’ understanding of a real OHCA scenario and their reflections about receiving visual information in real-life cardiac arrest situations is unknown. We hypothesised that it could be a benefit for dispatchers to perceive visual information from the scene of OHCA. The aim of the present study was to explore the medical dispatchers’ perception of the bystanders’ responses and dispatchers’ reflections about the added value of visual information in real out-of-hospital cardiac arrest (OHCA) situations investigated with CCTV recordings. The Emergency Medical Dispatch Centre (EMDC), Copenhagen, Denmark serves 1.8 million inhabitants. All 112 emergency calls are initially handled by a call centre that identifies the location and then forwards all medical calls to an EMDC. An emergency medical dispatcher answers the call and determines the appropriate response, while a technical dispatcher handles the logistics of simultaneously dispatching ambulances. The medical dispatchers are specially trained registered nurses and paramedics. The decision-making process is supported by a standardised national criteria-based dispatch tool (Danish Index for Emergency Care) . In case of OHCA, the medical dispatchers guide the bystanders to perform CPR until arrival of the ambulance and to localise and use the nearest automated external defibrillator (AED). The study was a qualitative study designed as an explorative interview study including medical dispatchers who had previously handled a case of OHCA captured on CCTV. The CCTV recordings were collected in relation to a previous study (11). The primary researcher invited by e-mailed 10 out of 21 relevant medical dispatchers to participate. We chose medical dispatchers who were available (still employed and not sick or on maternity leave) and where the CCTV footage of the OHCA showed most information about the victim and the resuscitation attempt. No relationship to the medical dispatchers were established before the study. The medical dispatchers were interviewed individually at the EMDC with a timeframe from 6 months to one year after collection of the CCTV recordings. The duration of the interview was approximately one hour. First, the medical dispatcher listened to the audio recording until a natural break occurred in the conversation between the caller and the medical dispatcher – for example, when the medical dispatcher had to register information in the electronic system or changed the subject. The interviewer then asked the medical dispatcher to visualise his or her perception of the situation using mini-mannequins (Fig. 1). The medical dispatcher listened to the remaining part of the audio recording, thereafter the interview was continued. 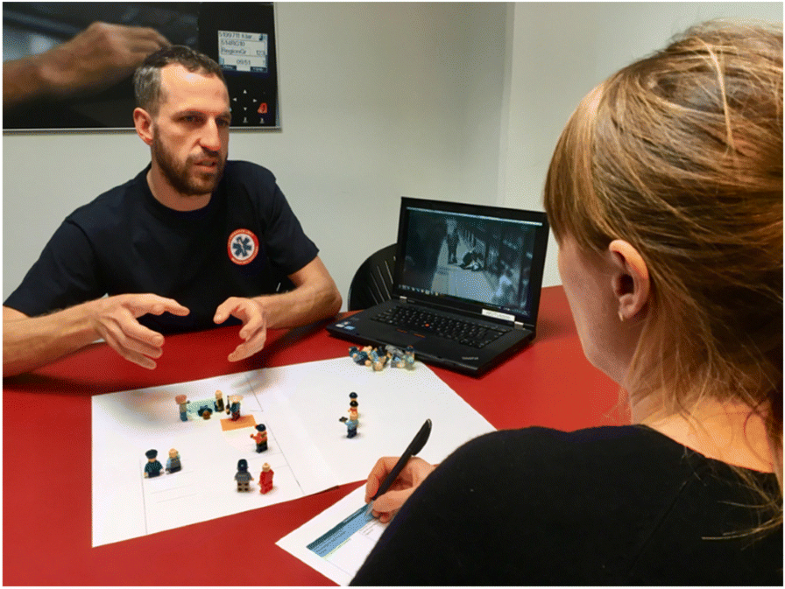 Finally, the medical dispatcher watched the CCTV, listening to the audio recording of the emergency call simultaneously, and was then interviewed about his/her understanding of the OHCA-scenario and reflections on receiving visual information. An interview guide for the semistructured interviews was developed prior to the study (Additional file 1: Appendix). A pilot interview was conducted with a medical dispatcher to evaluate the interview guide and the setup. The first (GL) and last authors (DOE) participated in the first three interviews. Thereafter, the first author conducted the interviews. Nobody else was present at the interviews. The interviews were videotaped, and the audio files were transcribed verbatim. We applied a qualitative research methodology using thematic analysis with an explorative and inductive approach. The first author followed Braun and Clarke’s six-step analytical approach, which has the following steps: familiarising with data, generating initial codes, searching for themes, reviewing themes, defining and naming themes, and producing the report . Codes and themes were organised using Nvivo10 software (QSR International Pty Ltd., Australia). A single episode of great importance was sufficient to form a theme. The team of researchers analysing the data consisted of two physicians with some experience in qualitative research (GL and TPM) and a professor in medical education who also had experience with qualitative research (DOE). All participated in all steps of the analytic process. After analyzing the eight interviews data saturation was research, but as the last interviews had been planned – these were conducted as well. Based on our previous analysis of the CCTV recordings we had a preconception that the CCTV would be a benefit that could affect our analysis. The themes were therefore presented to the medical dispatchers for any comments; none were given. Ten medical dispatchers were interviewed. Five of these were women. Four were registered nurses, five were paramedics, and one was a paramedic trainee. The length of experience in emergency medical dispatching was 28 months (21–45 months), median (range). None of the contacted medical dispatchers declined to participate. The characteristics of the situations in the 10 CCTV recordings are shown in Table 1. The medical dispatchers expressed an improved understanding of the OHCA scenario after they watched the CCTV recording. The CCTV footage provided more information about the victim, the physical setting and the bystander response. Table 2 shows themes, subthemes, and data extract examples. - “Many bystanders say: ‘I cannot tell. I do not know.’ It would be a benefit to get your own eyes on the scene.” (The comment refers to bystanders’ descriptions of the patient’s condition). In cases where the CCTV contributed with more close-up pictures of the victim, the dispatchers were able to observe the victim’s condition including consciousness, skin color, and respiration patterns. In all cases, the dispatcher could observe when the victim stopped having voluntary movements, as an indicator of unconsciousness. Furthermore, the dispatcher received information about the victim’s position: if the victim was held in sitting position, lying on the back, or lying on the side. The dispatchers sometimes thought the victim was sitting independently when he or she was actually being held in the sitting position, because the caller stated that the victim was “sitting.” In one situation, the dispatcher thought the victim was sitting by himself and therefore did not identify OHCA. The dispatcher also perceived more information about the physical setting with the CCTV recording, including the location of the victim and hence, the bystanders’ working conditions. In one case, the victim was lying in a doorway, which made it difficult for the bystanders to assist the victim. The dispatcher was not aware of this before he watched the CCTV recording. All OHCAs were in public places. If the caller did not mention the number of bystanders directly, all medical dispatchers thought there were several bystanders in the surroundings when the OHCA happened in daytime. The medical dispatchers’ perceptions sometimes failed when it came to estimating the number of bystanders helping the victim or performing CPR. Often the dispatchers thought more bystanders were involved. The medical dispatchers often presumed that the quality of CPR performed was adequate, and they asked few or no questions to get information about this, so in case of inadequate bystander CPR, the medical dispatchers’ perceptions were not in accordance with reality. The CCTV recordings provided an improved understanding of how the CPR was performed, including shift among laypersons to provide compressions, hands-of-time, hand position, compression rate, and continuous evaluation. Furthermore, most medical dispatchers assumed that the callers were very close to the victims. In many cases, however, the caller was standing some distance from the victim. The medical dispatchers expressed that their improved perception of the OHCA scenario could improve the communication with the bystanders, their ability to guide more bystanders and the quality of CPR in the future. (Table 2 shows themes, subthemes and data extract examples). The communication could be improved because it would be easier for dispatchers to judge whether their messages were understood and actions initiated by the caller. Some dispatchers also thought time could be saved in gathering information, because the amount of necessary questions could be reduced. The dispatcher was also less dependent on continuous information from the caller and could potentially respond faster to changes. The medical dispatchers expressed that the improved understanding of the OHCA scenario would make it possible to participate more actively and make it easier to guide the bystanders. The bystanders who did not assist were seen as potential resources by the medical dispatchers, who. suggested better involvement of these bystanders at the scene. The dispatchers believed that CCTV provided an opportunity to correct poor CPR quality and continuously evaluate the CPR. Table 3 lists the themes, subthemes, data extract examples related to challenges of CCTV. The medical dispatchers also expressed concerns regarding the use of CCTV, including receiving too much information, which might be confusing when they had to alternate between several points of focus. Furthermore, concerns were expressed about potentially delayed dispatch of an ambulance because the dispatcher might use time analysing the pictures before dispatching the ambulance. Potential logistic and technical issues were also raised, such as time spent on connection for live transmission and the quality of the pictures. Furthermore, one dispatcher had thoughts about psychological aspects for the dispatcher in watching these recordings. This was the only theme that only contained one episode. The medical dispatchers expressed that the CCTV footage contributed valuable information about the OHCA patient, the physical setting, and the bystanders’ response. The improved understanding of the OHCA scenario with CCTV could improve DA-CPR because a dispatcher could more easily follow up on what really happens at the scene and provide better guidance to the laypersons participating in the resuscitation attempt. Challenges of receiving visual information could be logistics, delayed EMS dispatch, poor video quality, receiving too much information, which might be confusing when dispatchers have to alternate between several points of focus. Our study is unique because it provided the dispatchers the possibility to see what really happened in an OHCA scenario and afterwards reflect on the use of visual information. In our previous study, where we analysed CCTV recordings, we hypothesised that the medical dispatchers´ situation awareness and communication could be challenged by not being able to see the OHCA scenario . A limitation of the study was that the medical dispatchers were never interviewed about their understanding of the OHCA scenario or their reflections on the added value of receiving visual information, as we did in the present study. The medical dispatchers expressed that visual information could improve their understanding of the OHCA scenario. Our findings are in agreement with a study from Johnson and Bolle , where they conducted interviews with six dispatchers after the dispatchers’ participation in simulated cardiac arrest scenarios using video calls in five scenarios and normal audio calls in five scenarios. They found that video calls were more useful for obtaining information and providing adequate functionality to support CPR assistance compared to audio calls. The only challenge with video calls was the risk of “noise,” because the video call provided more information and more impressions, some of which might be unnecessary. This was also in agreement with our study where the dispatchers questioned whether there could be “too much” information to handle. While visual information might improve dispatchers’ understanding of the rescuers’ situation and the assistance they provide, training in handling additional visual information during the emergency call seems necessary. Other simulation studies have focused on CPR quality with video-instructed DA-CPR [15–20]. Lin et al. made a meta-analysis comparing video-instructed DA-CPR with audio-instructed DA-CPR and found that the compression rates were closer to the recommendations . Improved hand position, correct depth, and correct ventilation rates also tended to be associated with video-instructed DA-CPR, but data were insufficient for meta-analysis. Time without chest compression (“hands-off time”) was not included in the meta-analysis, but this too might be shorter . One limitation with video-instructed DA-CPR was that the time to first compression was longer . In the studies, video-instructed DA-CPR started with an instruction of CPR via video transmission. In countries such as Denmark where CPR rates are high , and where basic life support (BLS) is mandatory in schools and when acquiring a driver’s license , it might be unnecessary to show CPR instruction to get CPR started. Focus could be on evaluating the CPR quality by giving the bystanders feedback. High-quality CPR remains essential to improving outcomes [23, 24]. The existing feedback on compression technique includes voice prompts, metronomes, visual dials, numerical displays, waveforms, verbal prompts, and visual alarms. However, no studies have yet demonstrated improved survival. The ERC guidelines 2015  concluded that the use of CPR feedback or prompt devices during CPR should be considered as part of a broader system of care that should include comprehensive CPR quality improvement initiatives. The present study supports that visual contact might enhance dispatchers´ ability to give bystanders better feedback on CPR quality in the future. The dispatchers in this study acknowledged that they could have asked for more relevant information to get a better perception of the situation. Visual information might make it possible for the dispatcher to ask focused questions in a situation with limited time and to lead and guide the bystanders accordingly. One can speculate on whether or not BLS courses also should include topics such as communication with the dispatchers – how to provide important information from the caller to the dispatcher, and how to use all available resources at the scene and follow guidance from the dispatcher. Real-life CCTV recordings could be used to prepare laypersons in handling OHCA. Furthermore, contact and supervision through video calls could improve the rescuers’ confidence in stressful emergencies . This study has some limitations. The retrospective setting might influence the dispatcher’s perception, as the medical dispatchers may have acquired significant additional knowledge about the OHCA scenario content after handling the scenario. All dispatchers in the study knew that the case was about OHCA, but not all could remember the specific case. However, as the emergency call conversation proceeded, they received more information, which affected their perception at a given time. We tried to minimise this by introducing a break in the emergency call conversation. The long time from the OHCA to the interview might be an advantage as none of the dispatchers could remember the OHCA case in detail. If the period is short, the dispatchers might remember the full OHCA scenario from start to end. This might affect their perception in the beginning of the call. On the other hand, the long duration could be seen as a limitation as their perception could be different from when they actually handled the call. The methodology of using available CCTV implies that the cases are not representative for all OHCA. The number of CCTV cameras is limited and access might be restricted for medical dispatch centres. Smart phone ownership rates are high , and as the technology improves, citizens might expect video as part of an emergency call. Video call too EMDC is possible in some places in Asia (e.g., Taiwan, Singapore and South Korea), London and New Zealand but the usage has not been systematic investigated. CCTV often gives a bird’s-eye view unless the right conditions for zoom are present, whereas smartphones provide a better view of the victim, including assessment of ventilation and agonal breathing, which is a well-known challenge in the identification of OHCA [26, 27]. The present study supports that visual contact might enhance dispatchers´ ability to give bystanders better feedback on CPR quality in the future. Next step must be to investigate if video call can improve the quality of CPR in real life and improve survival. However, before live transmission is introduced, issues such as logistics at EMDC and training of the medical dispatchers must be addressed . The dispatchers need training on how to interact with the bystanders and guide the team. However, in simulations studies dispatchers found video-calls surprisingly easy to use and were surprised that they so quickly had adapted reliance on the picture . In conclusion, providing medical dispatchers with visual information from the location of OHCA might improve their understanding of the OHCA-scenario, which might enhance communication, their ability to guide more bystanders and improve the quality of cardiopulmonary resuscitation. Challenges with receiving visual information might be logistics, delayed dispatch, poor quality of the pictures and receiving too much information, which might be confusing when they had to alternate between several points of focus. JamesEdits Academic Editing did professional writing service. Gitte Linderoth: has received research grants from the Danish Heart Foundation and from the Danish foundation TrygFonden. Emergency Medical Services Copenhagen: has received unrestricted research grants from the Laerdal Foundation for acute medicine and from the Danish foundation TrygFonden. CAMES has received unrestricted research grants from the Laerdal Foundation. GL did all the interviews, the thematic analyse and drafted the manuscript. TPM participated in the thematic analyse. FF revised the manuscript critically for the important intellectual content and further interpretation of the results. FKL participated in the design of the study and further interpretation of the results. DOE toked part in the design of the study, participated in the interview-guide, participated in the first three interviews and she also participated in the thematic analyse and interpretation of the results. All authors read and approved the final manuscript. The Danish Data Protection Agency approved this study (PHV-2014-006). We applied for ethical approval from the Danish Council of Ethics (DNVK 1211665). However, approval was not needed as this was a retrospective study without interventions. All recordings were secured to allow access only to investigators. The names of the medical dispatchers were anonymized for all others than the researchers doing the interviews. It was voluntary to participate. Faces of individuals on the recordings were blurred to prevent identification. Any identifying data for victims and callers were deleted. The persons in Fig. 1 have given consent for publication. Song KJ, Shin SD, Park CB, Kim JY, Kim DK, Kim CH, et al. Dispatcher-assisted bystander cardiopulmonary resuscitation in a metropolitan city: a before-after population-based study. Resuscitation. 2014;85. https://doi.org/10.1016/j.resuscitation.2013.06.004. Lin Y-Y, Hsieh M-J, Sun J-T, Chang Y-C, Ma MH-M, Chiang W-C. Quality of audio-assisted versus video-assisted dispatcher-instructed bystander cardiopulmonary resuscitation: a systematic review and meta-analysis. Resuscitation. 2017. https://doi.org/10.1016/j.resuscitation.2017.12.010. Danish register for Cardiopulmonary Resuscitation. Annual report 2016 (in Danish). Resuscitation Council. http://genoplivning.dk/wp-content/uploads/2018/04/Dansk_Hjertestopregister2016.pdf. Accessed 03 Sept 2018. Demographics of Mobile Device Ownership and Adoption in the United States. Pew Research Center. Mobile fact sheet. http://www.pewinternet.org/fact-sheet/mobile/. Accessed 3 Sept 2018.